Billi Miller has a passion for recognizing farm women for their significant contribution to Canadian agriculture. She shares her personal story and tells how she fell in love with her farm life and the many women in her community that provided their support. 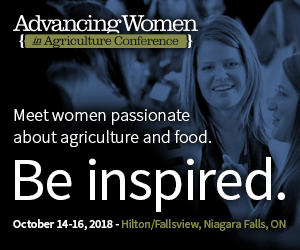 For more information and to register for the Advancing Women in Agriculture Conference East in Niagara Falls on October 15 and 16 click here.